Maker's Mark has unveiled a new exhibit by artist Dale Chihuly whose works of blown glass have gained him world-wide recognition. The exhibit, his second at the distillery, includes six large works of blown glass that visitors can view during tours as well as during some special night tours. The exhibit opened last week and will continue through October 31 at the Maker's Mark campus in Loretto, KY. For more information, go to www.makersmark.com/chihuly. Read the official press release from Maker's Mark below. Inspired by the distillery’s light-filled Burke House Welcome Center and surrounding lush campus grounds, Chihuly at Maker’sis a temporary, site-specific exhibition and the second installation commissioned for Maker’s Mark by Chihuly. His first celebrated permanent installation, The Spirit of the Maker, was unveiled in 2014 as a tribute to Maker’s tradition of bourbon making in Kentucky. Chihuly at Maker’s is comprised of six large-scale art installations sited throughout the distillery grounds. From July through October of this year, the Maker’s Mark Distillery will be transformed by Chihuly’s dramatic works of art purposefully set throughout the historic landmark campus to complement the distillery’s landscape and architecture. Included in the exhibition is: Summer Sun, a 12-foot tall blown glass and steel sculpture; a collection of five fiery-red Baskets; and an 18-foot wide Crimson and Chestnut Fiori Boat, which combines a range of forms massed together in a traditional wooden boat. In addition, on Saturday nights from July 22-Oct. 7, visitors will be able to enjoy the remarkable art of Dale Chihuly in a new way with “Chihuly Nights,” an exclusive and stunning look at the exhibition after dark. 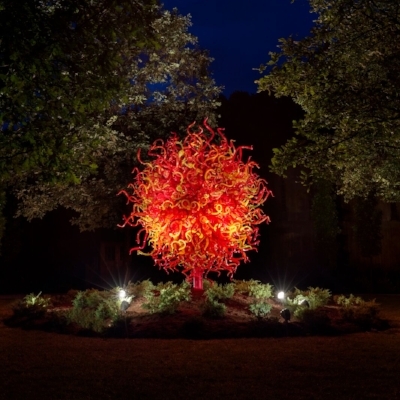 As the sun sets, guests will experience the enchanting glass sculptures glowing with light against the dark Kentucky sky. Maker’s Mark Bourbon and cocktails alongside fine Kentucky fare from the distillery’s resident chef, Newman Miller of Star Hill Provisions, will be included.Admission to Chihuly Nights is $20 and includes admission to the distillery grounds for self-guided tours. Separate tickets are required for day and night. Maggie Samuels, wife of Maker's Mark creator Bill Samuels Sr., is credited with establishing the brand of Maker's Mark, including the distinctive bottles, the torn appearance of the labels and the hand-dipped red wax. Maker's Mark is one of the most well-known Bourbon brands in the world. Located in Loretto, KY, the distillery has preserved the traditional processes like a 1935 printing press and those famous bottles hand-dipped in red wax. Bourbon and Barns recently caught up with Rachel Ford, a Distillery Diplomat for Maker's Mark. Bourbon & Barns: Maker’s Mark has a distinctive history and is synonymous with Kentucky's Bourbon country. How did Maker's Mark get its start and what has the Samuels family meant to the business? Rachel Ford: Bill Samuels, Sr., came from a long line of whisky distillers, so it was in his blood. He served in the Navy, but after retiring, the family business pulled him back in and he set out to make his perfect bourbon. Smooth. Forward finish. No bitterness. He found a distillery with a 10-acre spring-fed lake with a limestone shelf great for making bourbon and bought it for $35,000 back in 1953. And thus Maker’s Mark was born. BB: Maker’s Mark has worked hard to preserve the tradition of the distillery. This is apparent even in the use of a 1935 printing press to make the labels for each bottle. Why is it so important to Maker’s Mark to preserve processes like these? RF: From the printing press, to rotating our barrels, using a roller mill to gently crush our grains and hand dipping our bottles – every step of how we make our bourbon – is part of who we are. They were all important to Bill Samuels, Sr., when he was creating a smooth, full flavored bourbon that he could share with his friends. And that is what is still most important to us today. BB: One of the most distinctive features of Maker’s Mark is the red wax on the top of the bottles. How did this tradition begin? RF: We owe so much of Maker’s Mark and who we are as a bourbon to Margie Samuels. Her husband, Bill Samuels, Sr., created Maker’s Mark and she is credited for the branding and packaging. She not only named our bourbon, she designed the shape of the bottle, created the font (she was a calligrapher), the look of the torn label, and she also wanted the bottles to have the dripping red wax. To this day we still hand dip each and every bottle. BB: Maker's Mark bottles also feature the term "SIV" on the label. What does this mean? RF: The SIV on the label is basically the mark of the maker for our Maker’s Mark bourbon. The S stands for the Samuels family who have been making whisky for generations. Some say that Bill Samuels, Sr., who created Maker’s Mark, was the 4th generation distiller, thus the roman numeral four (not counting the generations before that were making the spirit on the wrong side of the law). Today, his grandson Rob Samuels, now carries on the family affair. BB: Maker’s Mark has three products: Maker’s Mark Bourbon, Maker’s 46, and Maker’s Mark Cask Strength. How would you describe the difference between these three products? What is the mashbill and is it the same for each? RF: The mashbill is the same for all of our bourbons. It begins with 70% corn, 16% soft red winter wheat and 14% malted barley. They all go through the same fermentation with the same yeast strain we have used for generations. Then they are all distilled to 120 proof for the low wine and 130 proof for the high wine. The differences really come in during the aging, which really shows how much impact the wood itself has on bourbon. Maker’s Mark is aged to taste, not time, anywhere from 5.75-6.5 years, with our warehouse team hand rotating them approx. halfway through. Maker’s Mark Cask Strength is then bottled at barrel proof, anywhere from 108-114 proof. Maker’s Mark is cut to 90proof. Maker’s 46 is explained more in depth below! BB: I understand Maker’s 46 ages in barrels using french oak staves. How are french oak staves different? How does this impact the flavor? RF: It sure does. 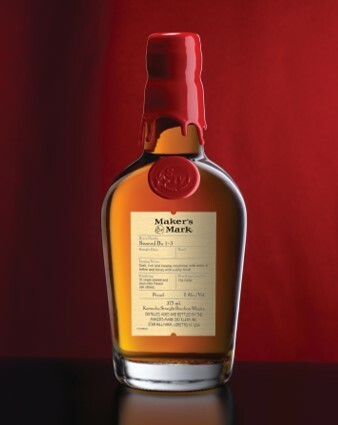 Maker’s 46 starts out with matured Maker’s Mark Cask Strength that has matured for 5.75-6.5 years. We then cooper the barrel to remove the barrel head, insert 10 staves of French oak that have been seared, fill it with Maker’s Mark Cask Strength and finish it for an additional 9 weeks. In that time frame, it ramps up the notes of spice (baking spices, not rye spices), caramel and makes for a longer finish on the palate. BB: I understand the first case of Maker’s Mark ever sold was bought by Keeneland Race Course. Has Maker’s Mark been involved with horse racing through the years? Is it involved in racing today? RF: Indeed! We have continued our partnership with Keeneland for decades, helping raise money for various charities through limited-edition bottles, sponsoring a race at the track each year (called the Maker’s 46 Mile), and they were even the first place in the world to create their very own barrel of Maker’s Mark Private Select. This is the distillery’s newest innovation: a first-of-its-kind barrel program, the Maker’s Mark Private Select experience allows select retail customers to “make their own Maker’s” by finishing fully-matured cask strength Maker’s Mark Bourbon in a single barrel including their own custom selection of oak staves. BB: The American Pharoah bottle really stands out for its color and design. How did this bottle come about? RF: Of course, horse racing and bourbon drinking are a big part of Kentucky and our culture. So we were all pretty excited to experience American Pharoah’s Derby win and then watch him go all the way to a Triple Crown and even winning the Breeders’ Cup Classic. So it was a wonderful time to get to work together to create a special way to commemorate such an amazing accomplishment, combining 2 great loves together. BB: Maker’s Mark offers a variety of tours. What can visitors expect on a tour? RF: A truly Kentucky experience. Our distillery campus is such a special place, where we have been making our bourbon for over 60 years – since the very beginning! On our tours you can come and see where every drop of Maker’s Mark is made and see the entire process from distillation to hand dipping each and every bottle in our signature red wax. You’ll learn a bit about bourbon, its history and ours, and of course get to sample at the end to see what it is all about: the taste! We’ll even teach you how to dip your very own bottle in red wax. For more information on Maker's Mark Distillery, go to www.makersmark.com.